There are all sorts of lessons that the restaurant world should take note of from this dynamic hidden neighborhood spot along the busy Indian School Road thoroughfare at the border of Phoenix and Scottsdale, which I’m told is known as Arcadia. Before you delve further into the countryside paradise concept of Arcadia, this mini-mall filled version is much more akin to Los Angeles’ suburban town Arcadia than Tom Stoppard’s idea. Though the address says Indian School, it really could be somebody’s backyard or a parking lot alleyway instead, since this desert treasure of a neighborhood bistro is tucked away from apparent view on the rear side of the Gaslight Square shopping center. I would venture to guess at least 50% of diners might do the same as me, parking their car in the front assuming they’ll find the restaurant here somewhere, only to stumble onto it ten minutes later. In Phoenix’s heat, those could be ten very long minutes. 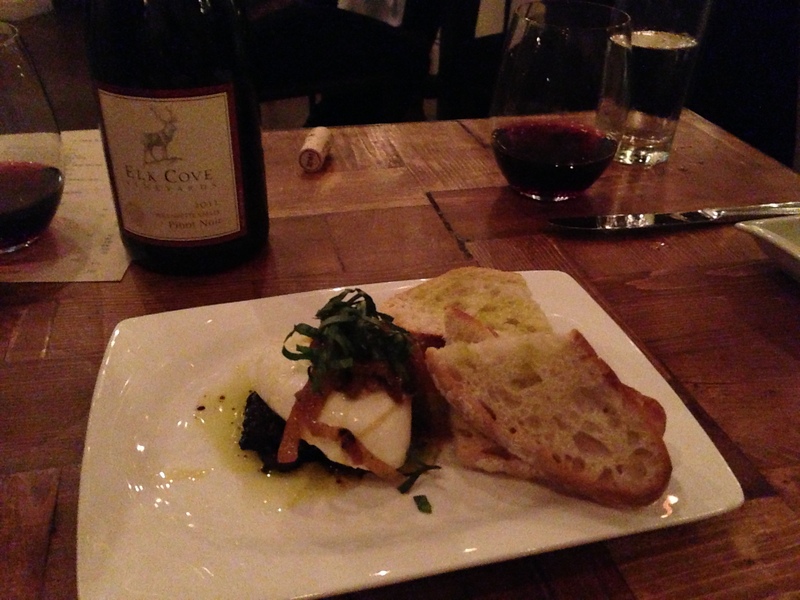 For this restaurant, I would walk from Downtown Phoenix for the smoked olives. This suburban speakeasy equivalent restaurant is the second iteration of Crudo. The chef Cullen Campbell’s original was a hit from 2009 to 2011, actually sharing space with a salon further east in Scottsdale. I’m not sure what it is with Crudo and hidden locales within shops or shopping centers. It proves to diners that a little research goes a long ways into uncovering where hidden talent is being displayed behind the stoves, behind the jewelery stores. Phoenix is one of the country’s most underrated dining regions, often only thought of as the faraway scorching hot home to Chris Bianco’s mythical pizzas. Amongst the Valley’s shining dining room stars, Crudo is no doubt one of the elite. 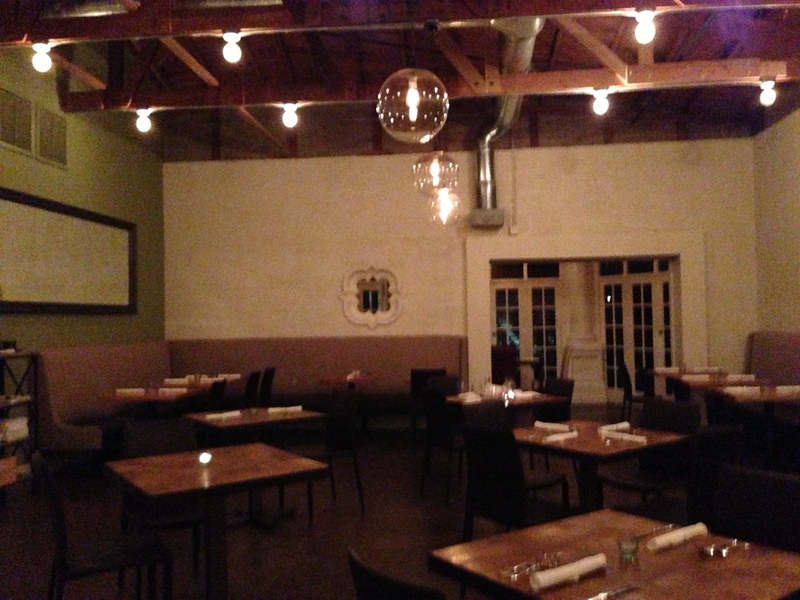 Crudo Part II just celebrated its first birthday. What a celebration I hope it was for such an accomplished restaurant after its initial year. But hold on folks. The actual birthday celebration will be held tomorrow, Thursday April 25th. Diners in the desert should be on their way to the phone for reservations immediately after finishing this article. I always tell fellow diners in that “professorial” tone, where if I were to teach a restaurants class combining the idyllic parts of separate restaurants to form one consummate restaurant, I would take this from here and this from here. Crudo is one of the closest examples I’ve dined at period that takes so many of those pieces and fuses them effortlessly together. Crudo is awfully close to the consummate example. 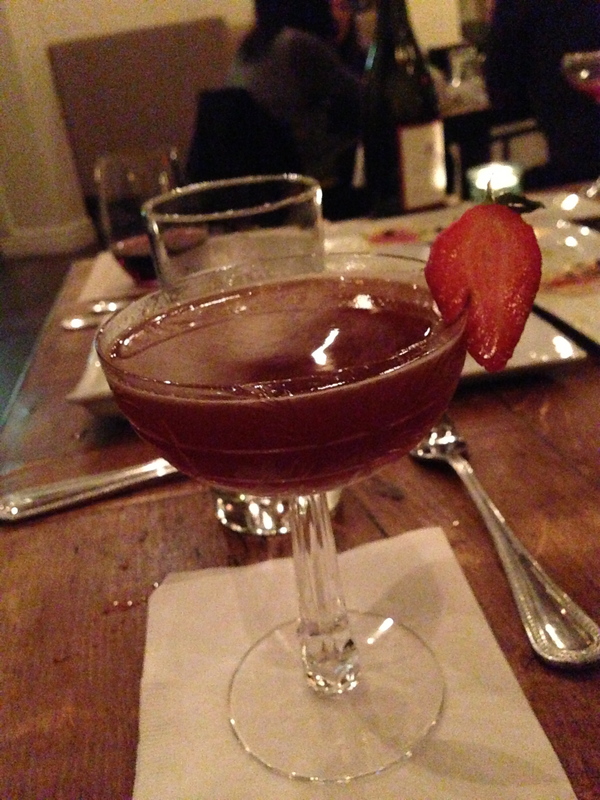 Superb craft cocktails from the adjacent Bar Crudo, along with a thorough, well-priced wine list? Check. Crisp pacing, friendly personalities, and extremely insightful service? Yes. A tidy, focused menu with flourishes, but not too many high wire acts to be gimmicky? Absolutely. 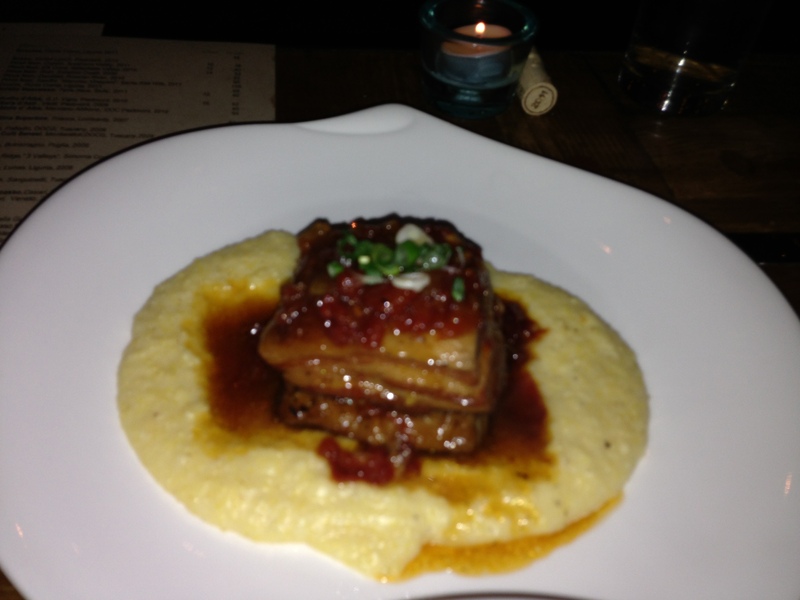 Terrific pork belly dish? Yes, even the most jaded pork belly saturated palate will fall in love as if it’s 2008 all over again after Campbell’s version. 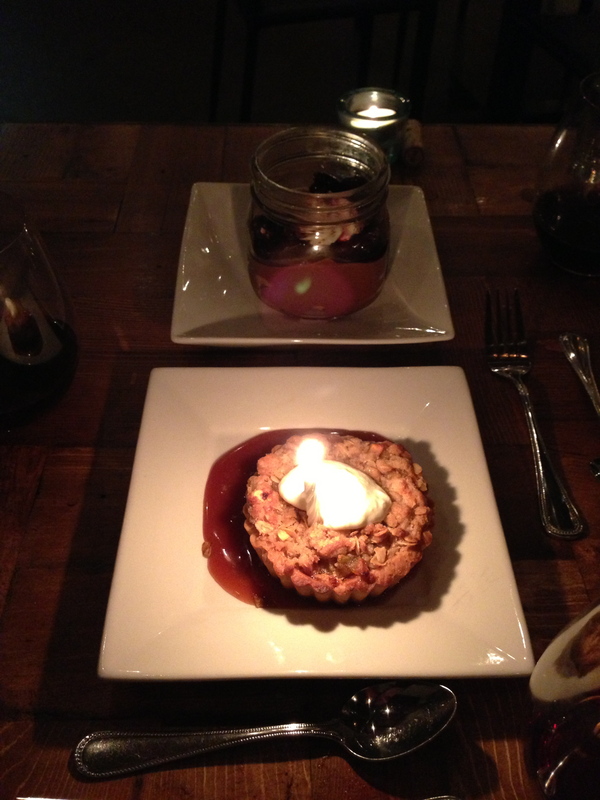 Then there are Tracy Dempsey’s desserts picking up right where Campbell left off on the savory side. Despite the off-beat locale, the atmosphere is not an afterthought. The spacious, modern setting strikes the perfect balance between a rustic greenhouse and urban atelier. The contrast is colorful and striking. On one side of the room you encounter New England- evoking white shutters then look up and find industrial pipes leading to a wood-beamed ceiling. Despite the exposed white brick walls and the carry-over of conversation from the bar, noise is not an issue. Did you hear that? Yes. In theory Crudo holds 50 seats, but if it were run by sardine can- minded Manhattan restaurateurs, there would easily be 100 diners at any given time. Even the restaurant’s hours are somewhat civilized by industry standards: dinner five nights a week. There is no question that Campbell and his fiancée Maureen McGrath knows how to run a restaurant. 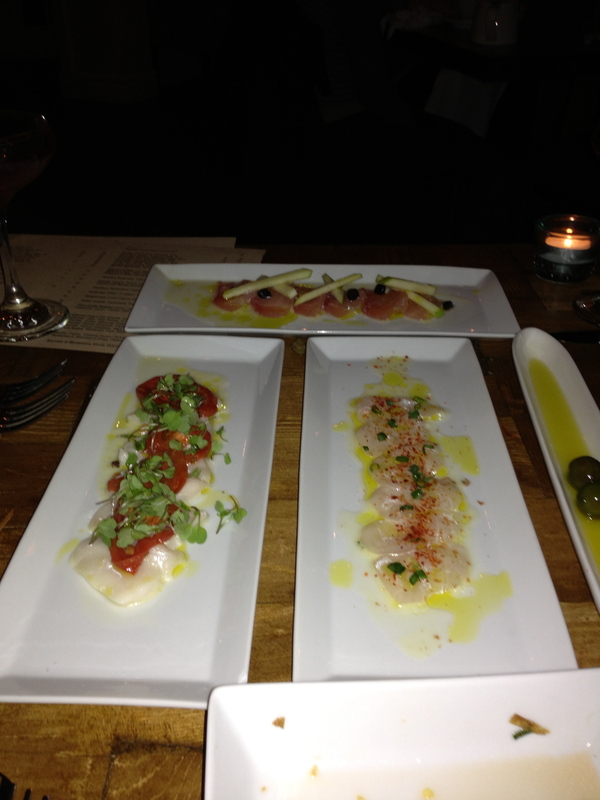 Phoenix residents and visitors are very grateful for the return of Crudo. Each evening should begin with one of Micah Olson’s cocktail creations. Formerly of the excellent Jade Bar at Phoenix’s Sanctuary on Camelback Resort, Olson has a special deft touch for balance in drinks. His skill is most evident in the seasonal cocktails, whether it’s blending jam notes and smoke in the “Tongue Tied” with Sombra Mezcal, Luxardo Abano Amaro, muddled strawberry, and a lime and lavender tincture, or a Gimlet gone Dolce Vita called the “Milano Gimlet” with the peculiar addition of Fernet Branca and cinnamon syrup. One half of the cocktail menu is the seasonal creations and the other half presents rejuvenated classics, including a “Penicillin” and a Sazerac using Bulleit Rye Whiskey. If you’re particularly lucky, you might be able to sample the fabled “Beet-Yuzu Gimlet,” created at the Jade Bar when Olson worked with the renowned Jason Asher. With all of the other superb components to the Crudo experience, it’s without question that Campbell’s Italian influenced seasonal cooking is what really lures diners to this shopping center. The menu itself is designed strategically to compliment both the diner and the chef. No dish rises over $18. Diners can enjoy three courses for $35, four for $45, and five for $55. It’s rare menu pricing that isn’t rocket science. 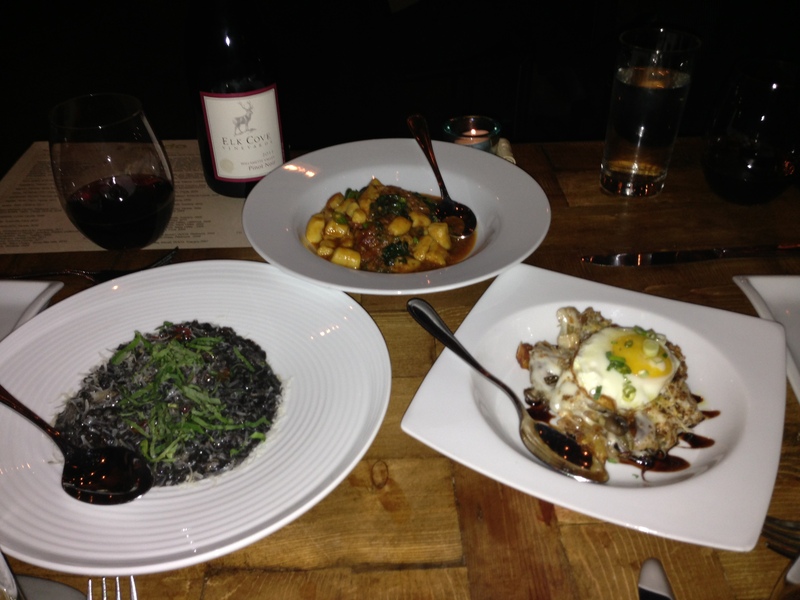 No item is too large or heavy, making sharing encouraged, and sampling numerous dishes mandatory. Campbell divides the menu simply into five categories with four to five choices in each: Crudo (Raw), Cotto (Cooked), Mozza (Cheese), Griglia (Grilled), and Lati (Sides). Yes, despite the crisp, compact nature of the menu, each table will still not be able to choose. Making sure to cover each category is the best advice for starters. This being Crudo, let’s not think too hard where to begin. Raw fish preparations soar here, veering more towards Italy than the customary Japanese bent. Here, lush butterfish is offset by salty razor thin lardo, and the bite of arugula. Albacore tuna receives blasts from both black garlic and (not too much) truffle oil, then restrained by petite apple slices. Pristine yellowtail heads to Sardinia, pairing with the island’s signature salt cured fish flakes known as bottarga. The customary ruby red ahi tuna is cubed, then joined by the non-customary trio of smoked olives, crumbled egg, and chives. I can see diners ordering the ahi merely for the smoked olives, much like diners at Jose Andres restaurants request the Martini just for the spherified olives with the drink. 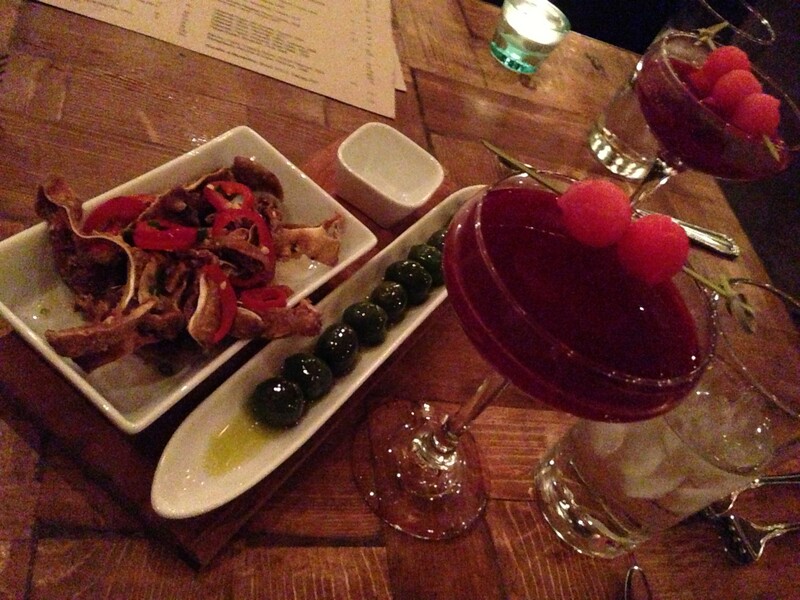 Speaking of those smoked olives, order a side of them. Arriving in a canoe shaped platter bathing in olive oil, the olives immediately call to mind hickory smoked bacon. In fact, it’s pecan wood that uses to smoke the olives, the pork belly, and the market fish with fennel and lemon zest. The crispy pig ears, much less chewy than the usual gelatinous texture, arrive on more tables than you’d expect for good reason. They’re first slow-braised for ten hours, fried to order, then finished with red Fresno chiles pickled in white balsamic vinegar, and some I’itoi onions. From the grilled section, that smoked pork belly square with a robust tomato agrodolce atop slick creamy polenta will win over any pork belly skeptics. The precise crisp skin to moist meat to fatty interior ratio is achieved; luxury with finesse. Tender short ribs are another winning wholesome choice resting above a cylinder of crushed fingerling potatoes, finished with a balsamic glaze and Tuscan kale. The showstoppers actually come from the “Cooked” and “Cheese” corners. Grilled mozzarella is a unique adaptation with tomatoes and dates. Seeing how pork belly and pig ears have already been golden smoky standards, it’s the fresh mozzarella hiding a mound of caramelized onions, blanketed by a bacon relish that receives nightly standing ovations. If Crudo has a warm signature, it has to be the night black squid ink stained risotto. Flakes of tuna and more smoky tomato blend with the not-so gentle edge of chilies for one of the more riveting risottos you’ll find. The grains of the risotto are right on the mark al dente to boot. Perhaps it’s a delicately rolled gnocchi night in a pork sugo with wilted rapini. Or, it might be the occasion for a breakfast at dinner where a mushroom gratin with mozzarella and soft poached egg reminds you of a refined savory bread pudding evolved to the umami fifth taste. Dempsey often times seems to be the only pastry chef in Phoenix since nobody wants to compete with her. Her name seems to appear on at least half the menus I’ve encountered dining around the area for the past several years. A not-so simple take on an apple pie with an apple and frangipane tart gets the classic sweet-salty addition of a formidable fleur de sel caramel sauce. Dempsey’s creativity is revealed with the usual afterthought, chocolate tiramisu, given a handsome facelift from just sweet enough cherry compote. The tiramisu relaxes in a mason jar (not my favorite dessert technique), ready to be mixed by diners with cherry sauce and whole marinated cherries on the chocolate-coffee mousse’s surface. Apparently, locals and the nation are taking note of Crudo. Campbell just returned from cooking at the James Beard House in New york and recently was inducted into the Arizona Culinary Hall of Fame. 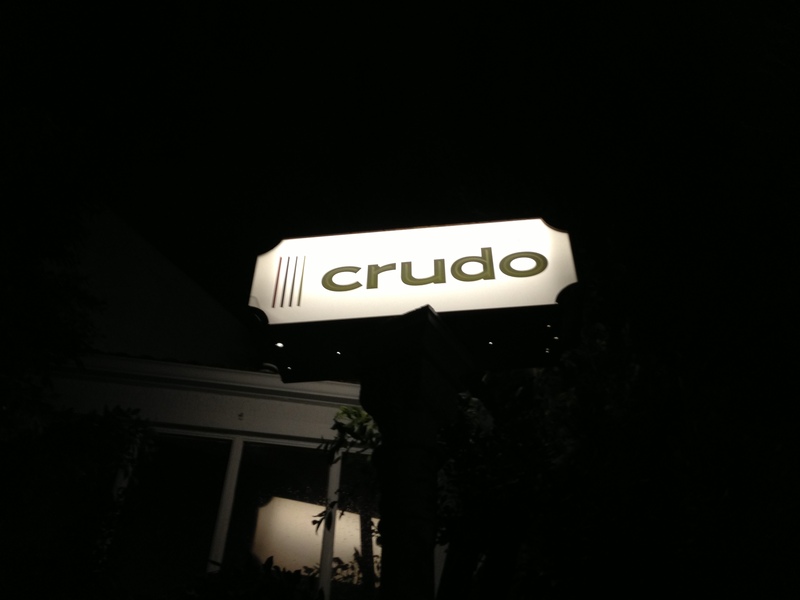 Just remember, Crudo is “around back” as the menu informs diners. Let’s hope this second Crudo stays around for a long time. Now, pass me another smoked olive, please. 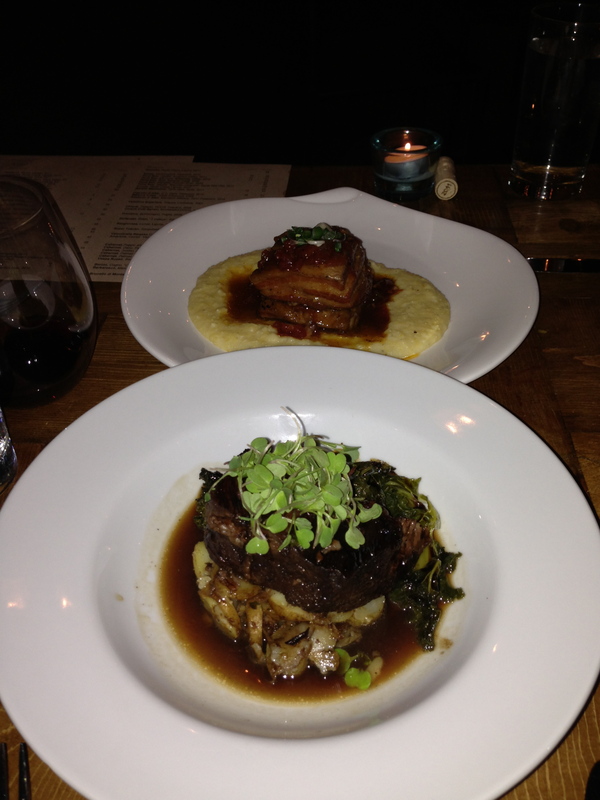 This entry was posted on April 24, 2013 by trevsbistro. It was filed under Phoenix, Restaurant Review .